Photo courtesy of ХАТТОРИ Кэихо. Billy, eat your carpet, there are starving children in India! But it looks like neopolitan. I like cut a rug before eating it. Isn’t that part of the the Postmodern Vegan Paleo Diet? If I am correct, this photo was taken at an Indian airport. Eating flying carpets, which provides the only means of transportation, is prohibited and will lead to prosecution by the airport authority. I can see the problem. That carpet looks like a cross-section of a giant layer cake. And don’t bring any carpets that eat anything in here, either. It gives you pile(s) anyway. The snack bars around there must be terrible! Cleaning the carpet doesn’t look like it’s permitted either. Not a problem. I’m on an all-Linoleum diet anyway. ETA: What is this sign supposed to say? Even if I bring my own? They’re not licensed for a floor show. It flies it when it eats it! The sign was supposed to say “(sitting and) eating on the carpet prohibited”. Unless it matches the curtains. But eating the wallpaper is perfectly fine! I’ll just rip up the carpet and lick the floor instead. Flight attendants: Security to Section A20. Someone mowing their carpets there. You’re not supposed to bring pets in your car and eat them – especially cows. But it’s my favorite thing to munch! Pink shirt guy to the left of the sign has been totally emasculated by this Order. Note the long gaze. That ought to scare the moths away! They would not need this sign if they kept those damned goats out. So much for the GLBT robby. Probably only occurs after 8 or so. Between 11 and 12 they also bite holes in the concrete. Razors are also strictly prohibited in this airport. is strictly for the uninhibited. It actually says. Carpet mateing is prohibited. They actually meant carpet matting. Buy hey! To get over 1 billion people you can’t be fussy. 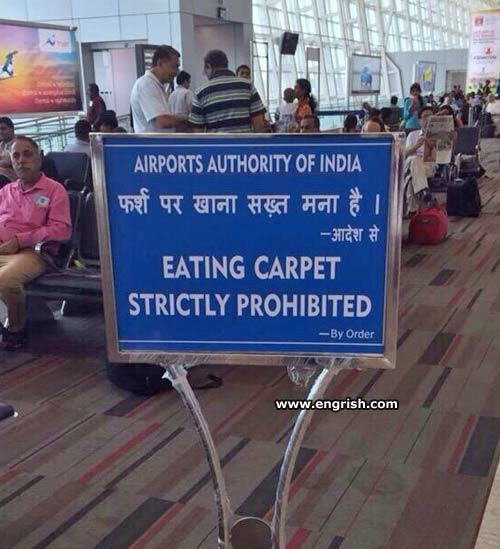 Actually, the Hindi text says “Eating [while sitting] on the carpet is strioctly prohibited”. Carpet is not mentioned. Perhaps the English text is for the arriving English-speaking clothes moths. Welcome to India, unless your a lesbian. Word has it the Indigo Girls have cancelled their tour here.